This free, printable business plan helps restaurant cafes, coffee shops and tea houses organize their key strategies and customer service plans. The long-term goal of COMPANY NAME is to serve quality food, have outstanding customer service and run and maintain a cost efficient base without sacrificing quality. COMPANY NAME serves high quality food and beverages in an inviting and friendly atmosphere at reasonable prices. COMPANY NAME is expanding its exposure through effective marketing as well as introducing the area to market segments that have not yet discovered the restaurant. 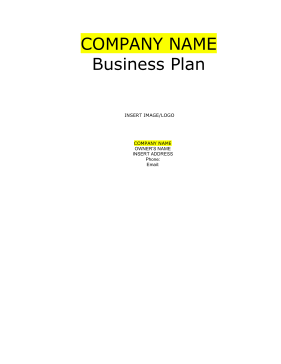 COMPANY NAME is a family owned restaurant that has been in business since May of 1995 by INSERT NAME (S). COMPANY NAME is located in [CITY], [STATE]. The beautiful [STATE] Valley is the setting for the City of [CITY]. Located on the [STATE] River in [COUNTY] County, it lies at the point where the states of [STATE], [CITY], and [STATE] meet. COMPANY NAME is a family-owned restaurant that serves American style food, and offers a comfortable, friendly atmosphere with friendly wait staff to small businesses, employees of government offices, hospital staff, Doctors, and Lawyers within the city of [CITY]. COMPANY NAME serves breakfast, lunch and dinner from a friendly wait staff. COMPANY NAME'S menu consist American style entrees. COMPANY NAME focuses on local residents and anyone passing by who wants to enjoy a good meal in a comfortable, friendly, down home atmosphere. COMPANY NAME'S market segmentation scheme is fairly straightforward and focuses on the target market, [COUNTY] County and [STATE] residents. These customers prefer certain services and quality of food and it's the Company's duty to deliver on their expectations.